In this post we examined 5 of the best-selling ethernet cables. Including the popular AmazonBasics model. 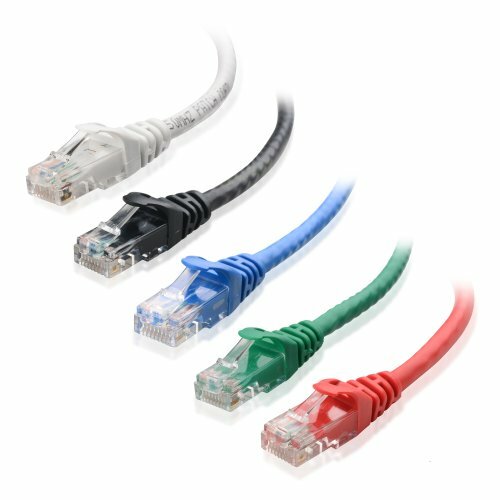 Ethernet cables are cables designed to carry a high speed or broadband signal from a modem or router to your computer. Most experts recommend getting a Category 5e or 6e cable if you want the highest speeds currently available (Source). The ethernet cable looks similar to a phone cable but is thicker because it contains more wires. Like most cables, electrical signals are transmitted through wires and there is a limit to how long a cable can be before they lose signal. Ethernet cables typically top out at 700 feet for a Cat 6 cable before you’ll notice signal drop-off (Source). There are different types of ethernet cables that range from Cat5 to Cat7. The difference between these categories is the higher the category, the higher the speed capability of the cable. Experts recommend going with the highest category cable you can get. Also, most Cat6 and 7 cables have technology that eliminates crosstalk, which is interference that can affect the signal (Source). In this piece, we look at 5 reasonably priced cables and compare them. The Amazon Basics RJ45 Cat-6 patch cable is available in multiple lengths from 3 feet up to 50 feet. 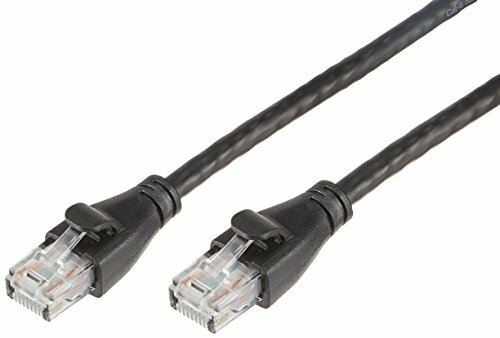 This cable is ideal for connecting your computer to your modem or router, or for setting up local area networks and offers decent speed at 250MHz and up 1 Gigabit per second. Amazon Basics products generally get good reviews from users and this cable is no exception. Most users agree this cable performs as advertised and is a good value for the price. Next up is the Cat 6 50 ft flat ethernet cable from Jadaol. This cable is flat as opposed to round like most other ethernet cables. As with the previous cables, this Cat 6 is rated for 1 Gigabit per second transfer speeds at 250MHz. Users liked the flat design, which lets them run the cable under doors and other tight spots. The next cable we looked at is the Vandesail 6.5 Cat 7 patch cord, which also is a flat design. This is a higher rated cable than others at Cat 7 and supports bandwidth up to 1000MHz and 10Gbs transfer speeds Source. If you need a pro-grade cable, this is one to look at. The Mediabridge 15 ft cable supports up to Cat6 and is rated at 550Mhz and 10 gigabits per second of speed. This is a rounded cord and is compatible with both Cat5e and Cat6 applications. The 10 gigabits per second is the highlight feature with this cord as it offers higher transfer speeds. Buyers said these cables are very sturdy and performed well at a fraction of the price. Last up is the Cable Matters 160021 Cat6 cable with snag-less connectors. 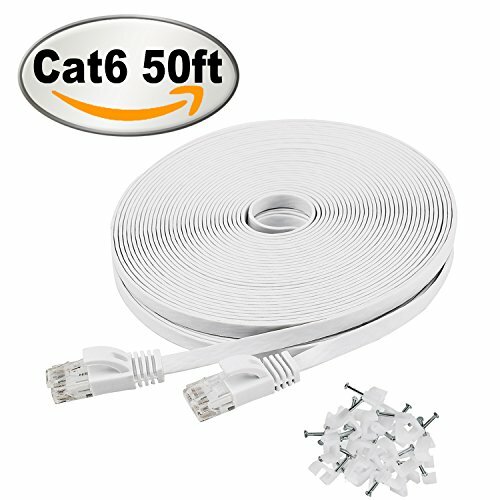 This is a budget pack that includes 5 Cat6 cables that are perfect for applications where length isn’t a requirement. They offer acceptable speeds and are well made and very flexible according to buyers. If you are looking to get an Ethernet cable, you might want to consider the Cable Matters Cat6 5-piece model. Users love the price/value ratio of this product, but some do complain of receiving a defective item. 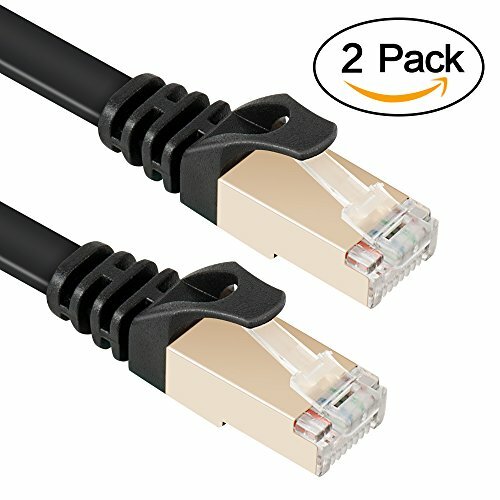 This network patch cable set offers universal connectivity for computers and network components (routers, switch boxes, network printers, etc.). The manufacturer states that it provides exceptional transmission performance and low signal losses. It is said to be suitable for Fast, Gigabit and 10-Gigabit Ethernet. Some of the features are: snagless design, 50-micron gold-plated contacts, flexible PVC jacket, stranded twisted pairs, pair separator, and bare copper conductors. The set is available in 6 sizes. This item might be a good choice if you’re looking for reliable connectivity. In general, buyers have a favorable opinion of these snagless patch cables. They agree that they are priced decently. Users conclude that they are not thin, but good thick high-quality ones. They appreciate that they are easy to snap in place and remove from your device. However, there are purchasers who complain that 1 out of 5 cables didn’t work, but had an open line upon receipt. The Mediabridge 15 Feet Ethernet cable is a good option for those who are looking for high bandwidth. Users like the performances of this item and so far have no complaints. 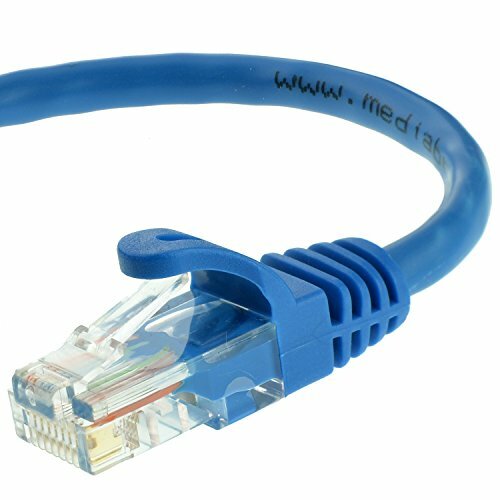 According to the manufacturer, thanks to the RJ45 connector, this product can be used for any Cat5e or Cat6 application, for both wired home and office networks. It is said to support up to 550 MHz and up to 10 Gigabits per second, which guarantees high-speed data transfer for server applications, cloud computing, video surveillance and online high definition video streaming. In addition, it includes an adjustable and reusable velcro strap for easy organization and storage. This item could be a good choice if you’re looking for 24AWG stranded conductors separated by PE cross insulation to prevent crosstalk. The general user consensus regarding the Mediabridge Ethernet patch cable is that it meets their expectations. Users agree that it delivers great performance and that it is sturdy and substantive, with the ends snapping firmly in place offering a solid connection. The Vandesail Ethernet cable could be a good option for high-performance networking applications, such as network adapters, hubs, routers, PS3, PS4, X-box, and others. Users like the accurate data transfer and reliability of this item, but some complain about the lack of connection improvements. This Cat7 STP shielded flat model, it is claimed, supports bandwidth up to 1000MHz and speeds of up to 10Gbps. As the manufacturer boasts, thanks to its design, it provides better protection from crosstalk, noise, and interferences that can degrade the signal quality. It is available in several sizes and colors. This item might be a good choice for those who want to boost their online gaming experience. The general user consensus concerning the Vandesail2-pack 6.5’ Cat7 LAN cable is that it is well-built and made of high-quality materials. Buyers state that they experienced no connection issues with the product. They appreciate that the cable is flat and not round. However, some buyers complain that it can be difficult to unplug it. There are those who state that they did a speed test before and after the purchase and saw absolutely no increase in speed. If you want a top-rated Ethernet cable, you might want to consider the JadaolCat6 model. Users like the performance of this product, but some complain of receiving a malfunctioning item. According to the manufacturer, this Cat 6 model provides a performance of up to 250 MHz and it is suitable for 10BASE-T, 100BASE-TX, 1000BASE-T/1000BASE-TX, and 10GBASE-T. In addition, it is said to provide exceptional transmission performance and low signal losses. Thanks to the fact that it is made of 100% bare copper wire, as opposed to copper clad aluminum (CCA) wire, it is fully compliant with UL Code 444. It comes with 15 cable clips. You can choose between 10 different colors and several sizes ranging from 1 foot to 150 feet. This product might be a good option if you are looking for future-proof speed. The general user consensus concerning the Jadaol Flat Internet network cable with snagless Rj45 connectors is that it is well-made. Users recommend it for anyone who needs a fast Internet connection. They appreciate the flatness and the snagless feature of the product. However, there are those who complain of receiving a defective item. For example, one online reviewer states that the cord arrived severed and several clips were missing. Another buyer complains about the excessive thinness of the wire, stating that it can be damaged easily. The AmazonBasics RJ45 Cat 6 Ethernet cable is a good option for those who are looking for a combination of high-quality performance and universal compatibility. Users like it for promoting fast and consistent connection, but there are those who complain about the quality. This product is said to transmit data at speeds up to 1,000 Mbps—10 times faster than its predecessors. As the manufacturer boasts, it keeps you safely and consistently connected with an impressive 259 MHz bandwidth. You can choose between 6 sizes (ranging from 3 feet to 25 feet) and 3 packaging styles. This item seems like a good choice for workplace productivity or at-home entertainment. In general, users have a very favorable opinion of the AmazonBasics Cat-6 patch cable. Many buyers share that it provides great signal transmission stability. They appreciate the tight link and say that it is well-built. However, there are those who complain that the item they received didn’t work at all. Several disappointed purchasers state that this is a sub-par product with which they experienced intermittent internet outages. If you are not familiar with the term ‘ethernet’ then know that it is one of the most commonly used types of network cable using a network connected by wires. 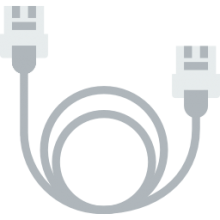 Ethernet cables are used to connect various electronic devices to each other inside a local area network, such as switches, PCs, and routers. Keeping in mind that these wires are tangible and physical, they inevitably have some limitations, both in terms of their durability and in the distance that they can cover while maintaining adequate signal strength. This is the main reason why there are various kinds of wires, which are made for specific types of requirements and situations. Around the world, network wires are typically designed with one or two basic industry standards, namely, Cat5 (Category 5) and CAT6 (Category 6). There is also a special kind of cable called a ‘crossover cable’ which is specifically manufactured to link together two computers. Relative to this, the majority of ethernet wires are designed with the goal of connecting a single computer to a switch or router. When networking cables are manufactured, they are made of two primary types, namely, stranded and solid. Stranded ethernet cables have the benefit of being less likely to develop physical breaks or cracks, which makes them very useful people who travel a lot or for home network systems. On the other hand, solid Ethernet cables provide a little better performance and they also provide a better level of protection against electrical interference. Solid ethernet cables are typically used on large networks, such as business networks, consisting of wiring under floors or inside the walls of workplaces. In order to fully and properly understand how ethernet cables work, you will need a significant amount of knowledge about computer science and networks in particular. However, for the layman, it can be explained without too much oversimplification. Basically, when a machine, such as a PC, wants to send data to another machine, such as a printer, then the first thing done is to check if the carrier (the primary cable connecting all devices together) is free. The carrier being free means that no one else is sending any data at the moment. When it finds a free carrier, the data is sent in packets through the network, and every single device that is a part of the network automatically checks if is the intended recipient of the data. Once the intended machine (in this case, the printer) receives the data and interprets it as being the recipient, it takes in the data packets. If the carrier is not free at the moment, then the sending device will wait for a few thousandths of a second till it checks if the carrier is free or not. This is why network seems to work in real time because communication between devices takes place so rapidly.